Neighborhoods in Action to Build a Better Bayfront. Learn more about our initiatives to improve housing quality, enhance parks and public spaces, and create community events. The OWB Community Plan, completed in 2016, is our roadmap to enhancing the quality of life in the West Bayfront neighborhoods. We hold a variety of family-friendly events and meetings. Check here for upcoming events and meetings in the community. OWB’s mission is to enhance the quality of life in Erie’s West Bayfront neighborhoods through civic engagement, thoughtful development, historical preservation and neighborhood pride. Our West Bayfront is an inclusive and thriving community where neighbors look out for neighbors, partners work together to preserve and enhance the West Bayfront’s unique assets, and mobilized residents are shaping the future of our neighborhoods and our city. While there are many ways to invest in Erie’s West Bayfront, our organization would not be able to maintain its impact without your continued generosity and financial support. Give on Erie Gives Day in August, or online anytime. We are infinitely grateful for the willingness of businesses and community members to give. It is our donors that push our many projects forward toward completion. 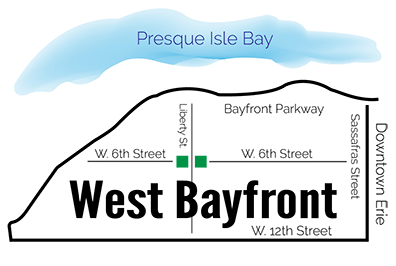 Click above to invest in Erie’s West Bayfront.